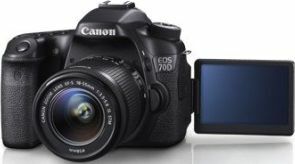 The Canon EOS 70D is a DSLR model that offers a powerful series of controls. It has a crop sensor with a 20.2-megapixel resolution total and uses a strong design that is impressive and offers more than enough control features. The camera especially offers accurate focusing features to make it easier to operate. This camera is a popular choice for professionals and newcomers alike. It offers enough power but still has enough support for even the newest users to make it easier for them to take photos the right way. The sensor on the Canon EOS 70D is a 20.2-megapixel crop sensor. It uses a dual pixel CMOS AF feature that identifies signals on an image and reviews movements to help create a sharper image. This keeps blurring effects on the screen from being too prevalent. As a result, the user will get a better shot in a variety of environments. 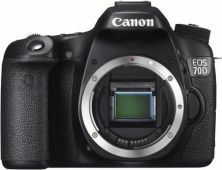 This sensor is an improvement over the 18-megapixel sensor of the EOS 7D. It is also capable of gathering detailed images to create a better total look. The EOS 70D especially uses a powerful sensor with a 5472x3648 pixel resolution total. It works with a wide range of ISO options from 100 to 12800 with the option to expand it to up to 25600 with one of various added lenses that may be attached onto its body. This ISO support is more than twice that of what is featured on the Canon EOS 7D or the competing Nikon D7100; those two cameras only go up to 6400. 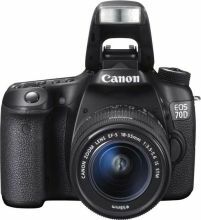 The body of the Canon EOS 70D offers a good body that will last for a long time. It is 675g in weight and has a size of 139 by 104 by 78.5mm. This uses an ergonomic body and is sealed well enough to where moisture will not be at risk of harming the inside parts of the camera. It is still best for people to use this in dry conditions and to keep it from getting wet just to be on the safe side of things. The control scheme is simplified in that there are not too many complicated or tough to use buttons all around the place. The controls include convenient metering and AF buttons that change how the camera operates in real time. The lens hub also has a simple manual feature that makes it easier for the user to control how the lens positions itself for zooming features among other points. This uses nineteen AF points to make it easier for images to come out clearly. It also has multiple white balance and metering pattern options. In terms of the ISO adjustments, this is done through the viewfinder on the back part of the camera to identify the quality of light in a space. The white balance works with several colour temperature settings as well. These settings can go from 2,000 to 10,000 kelvins in temperature, thus allowing items to be shot amazingly well and with enough control. The viewfinder doesn’t offer a 100 percent field of view like what the 7D has. However, the 70D does offer a 98 percent total with a 0.95x magnification feature. This gives the user plenty of spots to look at when finding ways to take great shots. The phase detection feature for the AF functioning in the live view shot is a popular part of what makes this special. This feature works to identify images based on how they move in real time. This in turn establishes a stronger control feature. This may also be used with one of many different lenses. The Dual Pixel CMOS AF system is used on this camera to handle about a hundred different lens types. The camera performs well with these lenses while also offering a simple add and release feature to keep them all fixed up well. The images created by the Canon EOD 70D and the technology used to make these images look great is an especially popular feature of this camera to see. This works with nineteen AF points to manage a better total shot. It uses a 3-10x digital zoom feature even when at a full HD setup. It also records H.264 setup features that help with making it look stronger and more efficient. This can make a difference when used properly. The battery on the Canon EOD 70D lasts for a while. The LP-E6 battery can be easily recharged with an AC adapter. It takes about 0.15 seconds for the camera to start up when the battery is charged up. The battery also works with an automatic shutoff feature. This can be configured to shut off the camera after one minute or more idle time. The setting can allow it to work after thirty minutes of idle time although the user could disable that feature if one prefers. The control feature is not all that complicated when used. The lightweight nature of the camera makes it easy for users to tote around. The memory card slot can handle SDXC cards that can handle thousands of photos at a time or several hours of HD video. The noise totals produced by the camera are minimal. This is thanks in particular to the great AF functions. The viewfinder could stand to be a little more accurate in terms of finding image data in real time. There are no panorama stitching features found within the camera. The live view feature takes a while for a shot to be reviewed. The AF function works a little better on slow-moving items than other features. Players looking forward to a great DSLR camera that isn’t complicated should see what the Canon EOD 70D has. It is a powerful choice that is easy to use and isn’t all that complicated to use.